An intent crowd at the active shooter training. 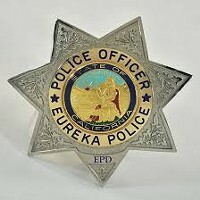 "Don't ever say it won't happen here," said Eureka Police Capt. 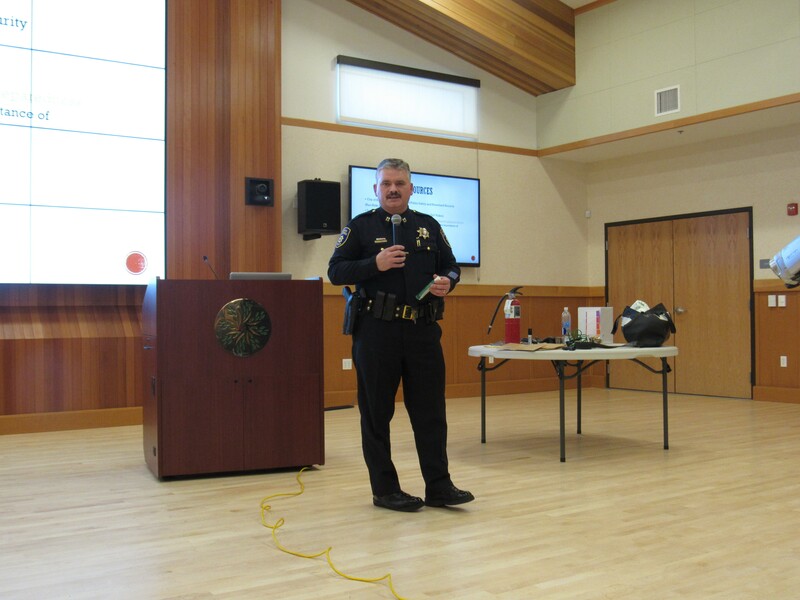 Brian Stephens, who led a training on active shooter situations to a packed audience at the Sequoia Conference Center on Thursday afternoon. 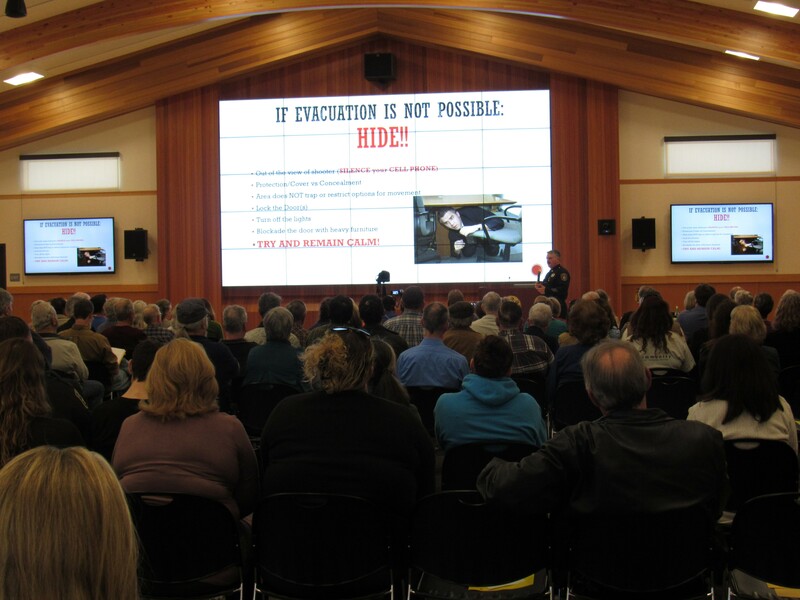 The presentation, which included several training videos and a demonstration with volunteers from the Eureka Boys and Girls Club, had practical advice for those who might face an active shooter in their school, place of work or public gathering. 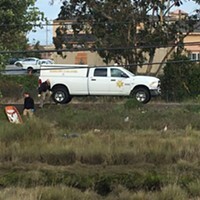 Although Humboldt County has not experienced an active shooter situation, Stephens was careful to point out that even smaller communities had been victims of armed shooters intent on killing others. The presentation included information from Department of Homeland Security guidelines, which encourages those in an active shooter situation to first run away from the assailant, then to hide (turning off cell phone ringers), and finally, if there are no other options, to fight. "Commit to your actions," said Stephens. "You have to do it with everything you have inside of you. Everybody has to act in unison." He added that chairs, tables, computer monitors, rolled up magazines and hand sanitizer can all be used as weapons, and that fire extinguishers are an overlooked but useful weapon. Sprayed directly on a person's face, a fire extinguisher can take a shooter's breath and vision away. EPD dispatcher Katie Hill gave advice on how to report an incident, including telling dispatch where an incident is, how to describe the suspect and what information dispatchers can use to help first responders. 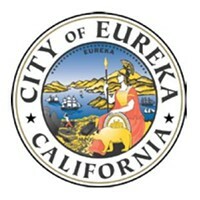 Stephens added proudly that response time in Eureka is between two and three minutes, but multi-jurisdictional law enforcement agencies may also be called to respond, meaning that there may be personnel in many different uniforms present at the scene. Stephens explains how hand sanitizer, rubbed in a shooter's eyes, can be an effective weapon. In a private interview, EPD Chief Andy Mills said that he had received criticism for not shutting down schools during a recent shoot-out between district attorney investigators and a fugitive that took place close to Zoe Barnum Elementary. His response was that, like most incidents, it was over within less than five minutes. Balancing safety with the emotional health of students is a challenge, he said. "I don't want children being fearful every time they walk into their school," said Mills. While the Department of Homeland Security's active shooter response instructions specify that you should fight "as a last resort, and only when your life is in imminent danger," both Stephens and Mills said that whether or not those with concealed carry permitted guns approach and engage a shooter is an individual choice. They pointed out the difficulty of hitting a moving target (who might be wearing body armor) at a great distance and the fact that arriving officers will be looking for anyone with a weapon. According to the presentation, only five of 150 active shooter incidents were ended by civilians firing on attackers. While Mills suspects Second Amendment rights supporters would argue that means more citizens should be armed, he says that ultimately, "we don't know. ... We don't have the data." The presentation is available on Access Humboldt. For more information on responding to an active shooter scenario, visit the Department of Homeland Security website.